We should resist constructing self-serving myths about political figures — even someone as heroic as Winnie Mandela. First, the facts: regardless of what Euro-American pundits or obituary writers conclude about Winnie Madikizela-Mandela or what some white (and some black) South Africans say around braais, she was a hero to the majority of South Africans, and still is. Just witness the spontaneous outpouring of visitors and vigils at her home in Soweto and around the country; look at the tens of thousands who attended her state funeral earlier today. Various people and political movements have long appropriated Winnie Mandela as a symbol. Her death intensifies this. For a long time, depending on your point of view, Winnie Mandela served as an extreme militant or radical liberationist. She was contrasted with Nelson Mandela’s “reasonable,” conciliatory stance towards whites and capital at the end of apartheid. Such comparisons are now — as they were then — unhelpful. They also serve conservative ends. Those who make them conveniently forget that Nelson Mandela went to prison for advocating armed struggle. While some headlines sought to reduce Winnie Mandela to “Mandela’s former wife,” she was a major leader of the struggle in her own right and developed a political identity independent from her former husband. It is also the case that — despite the African National Congress (ANC) leaders now lining up to eulogize her — many in the organization never liked her, knew what to do with her, or were long at odds with her brand of radicalism. Outside the ANC, Winnie Mandela still provokes strong, contradictory reactions: the opposition Democratic Alliance (DA) leader Mmusi Maimane, reading the political mood, said “she was principled and stood up for the truth.” Young black women — for whom Winnie Mandela represents a black, feminist icon — photographed themselves #AllBlackWithADoek, while the populist-left Economic Freedom Fighters (EFF) declared her “the first woman president South Africa never had.” By contrast, Paul Trewhela — a white, former political prisoner, long at odds with the ANC and the Communist Party and now ideologically closer to the DA — compared her to Hitler and Stalin. A Reuters obituary combined an honorific with an old slur from Britain’s right-wing tabloid press: she was “mother, then mugger” of the nation. However you feel about her, Mandela led a big life that intersected with almost every major current of recent South African history. Engaging seriously with that life is a way of engaging seriously with history. Done properly, it could help us understand not just how South Africa got where it is, but where it’s going. The country faces a long overdue attempt to resolve the land question and remains wracked by deep class and racial inequalities. Understanding Winnie Mandela’s activism might help us through the quagmire. Understanding her struggles would mean avoiding the tendency to create new myths about how the struggle unfolded, its patriarchal character, or its strong-arm tactics that seeped through the movement with devastating consequences. Too often, there has been a tendency to silence complex discussions of Winnie Mandela’s political life. On the Right, people who believed the apartheid propaganda about her, or who are invested only in her weaknesses and faults, gloss over her heroic actions. Those on the Left, who wish to push back against the critiques, neglect the full range of her actions. It becomes a zero-sum game. Winnie Mandela became politically aware as a child in rural Transkei and was involved in political work early on as a trainee social worker in Johannesburg. But it was her marriage, in 1958, to Nelson Mandela, then already a veteran ANC leader, that thrust her into the national (and international) political and media spotlight. After only one year of marriage, Nelson Mandela went on the run. Shortly afterwards, he went to prison, where he would spend the next twenty-nine years. From then on, the mainstream framing of Winnie Mandela characterized her only in terms of her relationship to Nelson Mandela; she existed to “keep Nelson Mandela’s memory alive” and was expected to live out the stereotype of dutiful, waiting wife. Instead, over the next two decades, Winnie Mandela emerged as arguably the most visible leader of the resistance, alongside Steve Biko. And she transcended Mandela and the ANC in the process. The ANC — its aging activists subjected to bannings, imprisonment, and exile — was in decline at the time. Winnie Mandela, meanwhile, proved adept at reading the changing political winds and crossing political boundaries, whether working openly with Black Consciousness activists (which the exiled ANC leadership despised) or providing open support and solidarity to activists leading the 1976 student uprising. After the government blamed her for the 1976 uprising, she was first detained and then, in 1977, banished to Brandfort, a remote Free State town. But instead of cowering, Winnie Mandela radicalized the town’s black residents, flouted the rules of her banishment, and recruited combatants for the ANC’s armed wing. And she did all this in the face of constant harassment, banning, imprisonment (including nearly eighteen months in solitary confinement), and torture. When reviewing her life, one is struck by how painful and lonely forced exile was for her, as a woman, a wife, and a mother, and the indignity with which she was treated — not as revered as Nelson Mandela, yet subjected to brutal punishment and humiliation. What also stands out about this period of her life is how she openly taunted and challenged the state and its agents, police, and spies. Go back, look at film footage. 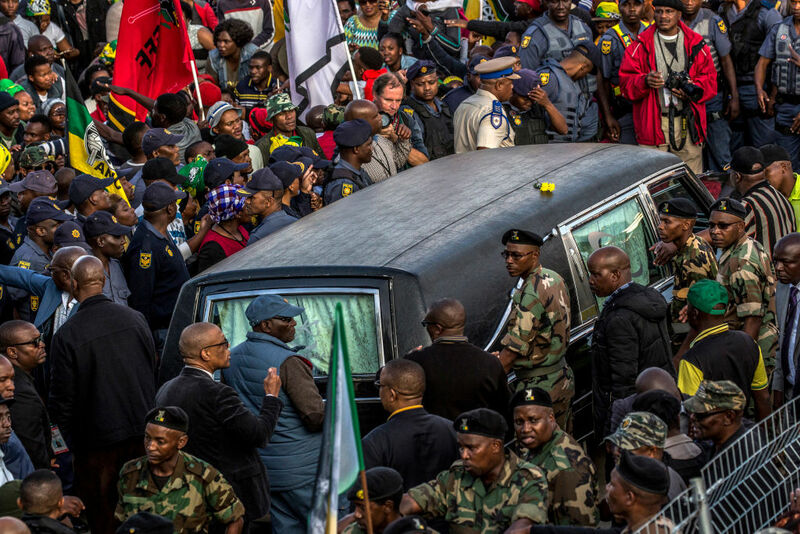 There are extraordinary scenes of Winnie serving as a pallbearer, carrying the coffins of activists, an act usually reserved for men. The effect on ordinary people was remarkable. It still is — on women, especially. Her defiance challenged the ANC to reconsider what a woman should be or do in political struggle and social movements. She struck fear into the heart of white patriarchy. This is the Winnie her admirers and supporters want us to remember now above all else — the one that resonates strongly with black university student movements fighting the government for free college education and to “decolonize” curriculums at universities and the EFF. It is what happened to Winnie Mandela after 1986 that divides opinion even on the Left. Between 1986 and 1989, her politics took a dramatic turn following her return — in defiance of police orders — from Brandfort to Soweto to her old house. She had to reinvent and reinsert herself in a newly configured political world. While she was in Brandfort, prospects had improved for resistance politics. The United Democratic Front, founded in 1983 to oppose apartheid reforms, had transformed into a national resistance movement and was operating openly in the country. In 1985, black trade unions — taking advantage of labor-law reforms — had formed a national federation, COSATU. The result was the first real mass movement against apartheid since the 1950s. More crucially, the terrain of struggle had shifted. Politics was no longer reliant on charismatic individuals like Winnie Mandela. There were literally thousands of Winnies, radical and eager to throw themselves at the regime as fearlessly as she had — but as a mass. The new generation of leaders spearheaded countrywide boycotts over rents and over conditions in schools. They rejected sham elections, openly carried ANC flags, and adopted the landmark Freedom Charter. They set up structures to ensure internal accountability. Defenders point out that Winnie Mandela was not alone in adopting this style of politics — many male political figures in the ANC also dabbled in it. Winnie was simply targeted for criticism and sanction because she was a woman. What’s more, they argue, the 1980s resembled a “dirty war” — a conflict that the National Party government didn’t contest according to parliamentary rules. Responding to apartheid’s brutalization demanded similarly dirty tactics. Things did not improve for Winnie Mandela after 1990. Upon her husband’s release from prison, she was thrust into the role of wife, which did not suit her. She went to work as the head of the ANC’s social-welfare department, only to be fired shortly after. In 1991, a court found her guilty of kidnapping in the Stompie case. (The resulting six-year sentence was later reduced to a fine.) Nelson Mandela appointed her a government minister in 1994, a job from which she was also dismissed over irregularities at her office. By the early 2000s, she was mainly making headlines for publicly clashing with President Thabo Mbeki and contradicting the party’s leadership. Then in 2003 her political career effectively came to an end with her conviction for defrauding members of a funeral fund. Still, Winnie remained very popular among ordinary ANC members: in 2007, when Jacob Zuma unseated Mbeki as ANC president, she received the most votes for the party’s national executive committee and two years later, when a general election came around, she was the fifth-highest candidate on the ANC’s list of MPs. The rank and file still revered Winnie, perhaps because of the (justified) sense that she had been persecuted and because she represented an uncompromising militancy that the ANC leadership was increasingly jettisoning. In the wake of her death, Winnie Mandela’s most ardent supporters have noted a final episode in defending her legacy: her public showdown in 1998 with Archbishop Desmond Tutu at the Truth and Reconciliation Commission (TRC), where Tutu demanded she concede that “things had gone horribly wrong.” The attack, they charge, was politically motivated. After all, this was the period when the portrait of Winnie as her husband’s noxious foil was in full swing, mainly because she was a loud critic of the economic terms of the transition. In the face of mainstream media, business, and whites who wanted reconciliation rather than redress, she condemned neoliberalism, state corruption, and the open racism papered over by “Rainbowism.” She also, famously, repudiated Mbeki’s AIDS denialism. And while she was singled out by the TRC for her actions in the late 1980s and her excesses have been periodically equated with that of apartheid’s, no other ANC leaders — or worse, apartheid leaders — were treated in the same way. All of this is largely true. Still, Winnie’s supporters have been silent when it comes to her role in the divisive politics within the ANC Women’s League and the corruption allegations she faced when she was a minister — perhaps because too many South Africans are still looking for easy narratives. Good versus bad, this or that. By the time police murdered striking miners at Marikana in 2012 and students went on strike over racist symbols and for free education in 2015, Winnie Mandela had long retired from politics. While she was still alive, it would be the students and the EFF of Julius Malema who would restore her political legacy to its pre-1986 form. They couldn’t be blamed. Two decades in, postapartheid South Africa had not delivered. Unemployment was at an all-time high, people were vulnerable, and the ANC was consumed by corruption, “state capture,” and leadership struggles. The ANC’s ideological project had run into a cul-de-sac. Winnie Mandela’s posture of feminist radicalism and her rejection by the ANC seemed very attractive as a political framework. Malema and the EFF derived some of their agitprop tactics (“pay back the money”) and flair for populism from her. But with Winnie Mandela, as with anyone else, we pick and choose what we want to remember. Consider her husband: like Winnie, he is usually separated from the movement that produced him, and his better qualities are usually attributed to some obscure source (some moral core or his individual qualities). Politics is reduced to claiming convenient symbolism from the struggle while removing it from its context in order to justify a current posture, not ideas or programs. Locating figures like Nelson or Winnie Mandela in history, by contrast, may help counter the knee-jerk personalization of politics and our tendency to cast people as cardboard figures, either “good” or “bad,” never as “complicated” human beings. Winnie Mandela’s mid-political life shows the dangers of using personalities for short-term political gratification. To a large extent this is what happened to the ANC under Jacob Zuma, and what may happen to the EFF under Malema. It is also how Ramaphosa’s own embarrassing political history with Marikana is elided as many South Africans clamor for a savior after the long years of winter under the Zuma faction of the ANC. It is important to defend Winnie Mandela’s memory from right-wing caricatures. But if we insist on disregarding the complexities of South Africa’s liberation history, we are in danger of becoming the people we criticize — and undermining our own political project. Sean Jacobs is founder and editor of Africa is a Country ; an associate professor of international affairs at The New School; and currently a Ford Foundation #AfricaNoFilter Fellow.